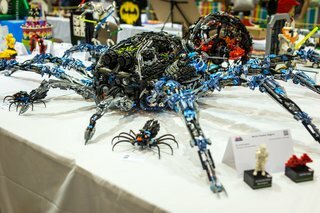 Three words most commonly heard at a LEGO convention: "that's so cool." That's the phrase I heard over and over again this past weekend at the annual Bricks by the Bay LEGO exhibition in Santa Clara--a sentiment well-earned. The Hyatt hotel ballroom where BBtB was held (also the home of California Extreme) was packed with attendees, builders, and retailers mired in all things LEGO. The room was split into themes: art pieces, historical, space/science fiction, and nautical, with each area showcasing a mix of sculptures and set pieces. Here are some of the entries that caught my eye. A spotlight on my favorite pieces coming up soon.